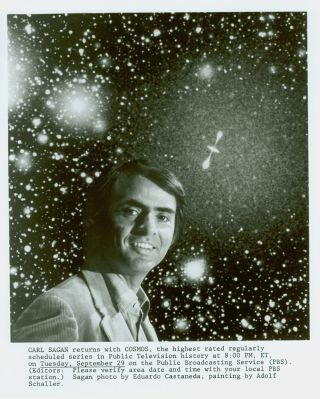 A portrait of Carl Sagan included in the archive housed by the Library of Congress. Famous astronomer Carl Sagan brought the wonders of the universe to people living on the planet he dubbed the "pale blue dot." Although Sagan died in 1996 due to complications from a rare bone-marrow disease when he was 62, his influence on the public still lives on today. His groundbreaking miniseries, "Cosmos: A Personal Voyage," used visual effects and down-to-earth commentary to bring science into people's homes. "I was just a 17-year-old kid from the Bronx with dreams of becoming a scientist, and somehow, the world's most famous astronomer found time to invite me to Ithaca in upstate New York and spend a Saturday with him," Tyson said during the first episode of the "Cosmos" reboot. "I remember that snowy day like it was yesterday." "I already knew I wanted to be a scientist, but that afternoon, I learned from Carl the kind of person I wanted to become," Tyson added. "He reached out to me and to countless others, inspiring so many of us to study, teach and do science. Science is a cooperative enterprise spanning the generations." Carl Sagan also inspired another person who's helping with the "Cosmos" reboot. Seth MacFarlane —creator of "Family Guy" and an executive producer of the new "Cosmos" — has been a fan of Sagan since he was a child. "I have always been interested in science," MacFarlane said at a recent "Cosmos" event. "I remember seeing the original 'Cosmos' as a child and as an adolescent and as an adult. I've seen it a number of times." Sagan also put life on Earth into perspective. He orchestrated the "pale blue dot" photo taken by Voyager from more than 4 billion miles (6 billion kilometers) away, showing Earth as a tiny point of light, as humans have never seen it before. "Every saint and sinner in the history of our species lived there on the moat of dust suspended in a sunbeam," Sagan said of the photo. "The Earth is a very small stage in a vast, cosmic arena. Think of the rivers of blood spilled by all those generals and emperors so that, in glory and triumph, they could become the momentary masters of a fraction of a dot." Seth MacFarlane and Ann Druyan look at items from The Seth MacFarlane Collection of the Carl Sagan and Ann Druyan Archive, which were on display today at the Library of Congress for the official opening of the archive. Sagan was more than a public figure and science communicator; he also contributed to science and exploration. Voyager 1, now the farthest man-made object ever launched into space, carries a piece of Sagan's legacy with it into interstellar space: Each of the Voyager probes holds a golden record inscribed with messages and sounds from Earth curated by a committee chaired by Sagan. "The spacecraft will be encountered and the record played only if there are advanced spacefaring civilizations in interstellar space," Sagan said. "But the launching of this bottle into the cosmic ocean says something very hopeful about life on this planet." Sagan was the first to create a greenhouse model for Venus' atmosphere, showing that the planet had much higher temperatures than previously thought. Sagan was also a NASA adviser for the Viking mission to Mars (the first U.S. lander on the Red Planet) and other missions in the solar system.